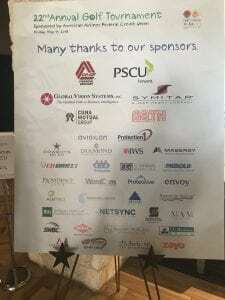 June 24, 2018 | By Fatima V.
On May 14, American Airlines Credit Union hosted their 22nd annual golf tournament benefiting Children’s Miracle Network Hospitals. Representatives from Cook Children’s and Children’s Health were present during the event and provided Kids-framed artwork for lead sponsors for the tournament. Thank you AACU for your continued support!